QiGlass designs are individually unique works of memorial art that suspend cremated ashes into glass works of art. With cremation becoming increasingly popular, QiGlass is a beautiful answer to what to do with ashes. Each piece is a perfect memorial that can be kept close and cherished often, providing a timeless, everlasting connection with those that have passed. 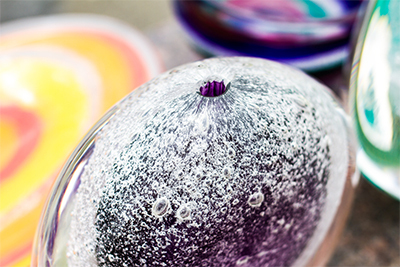 Made in partnership by Quiring and the Museum of Glass, each glass art piece is custom designed to your specifications. 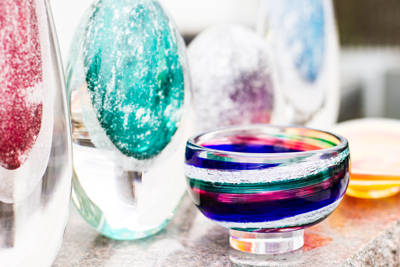 Turning your ashes to glass creates a very personal keepsake that continues your connection with whom you have lost. Place your order online here. A design kit with instructions and ordering materials to send a small portion of ashes directly to the glass studio will be mailed to you. Upon return, the glass studio will confirm receipt of the ashes and schedule production. (usually within 3-4 weeks). Completed art will be shipped back to you approximately 2 weeks after the annealing (cooling) and finishing process has been completed. If you have additional questions, please visit our FAQ or call (800) 824-0669 to speak with a Monuments.com Memorial Specialist. We will be happy to talk with you. If you would like to see a QiGlass memorial in person, please visit one of our QiGlass Partners. Quiring Monuments *Billie's Story from Aaron Horton *Raintree on Vimeo. We are honored to be chosen to handle your memorial and proud to apply our highest standard of respect and care throughout the process.